Rep. Mike Pompeo (R-Kan.) is sworn in at his confirmation hearing on January 12, 2017 as Donald Trump’s choice for the director of the CIA. Pompeo is now Trump’s choice for secretary of state. Photo by Joe Raedle/Getty Images. As the Senate considers whether to confirm CIA Director Mike Pompeo as President Trump’s secretary of state, new information is coming to light about his sparse record on foreign affairs, raising concerns about Pompeo’s ability to serve as America’s top diplomat. The Senate Foreign Relations Committee was set to vote on Pompeo’s confirmation Monday night. Pompeo has come under fire for remarks about Muslims. Now, disclosure documents reviewed by TYT also show that Pompeo once met with an Israeli official who was later honored by a group so extreme it was labeled a hate group. In addition, Pompeo’s handling of the U.S. embassy move to Jerusalem could be complicated by his apparent belief in the Rapture. A June 2015 videotape unearthed by Slate shows Pompeo referring to politics as an ongoing struggle, “until the Rapture.” Evangelical Rapture theology typically includes a belief that for Jesus to return, Jerusalem must first be Israel’s capital, and the world’s Jews must return there. Jews who do not then convert to Christianity will be destroyed in the end times. Pompeo has not publicly tied his belief in the Rapture to U.S. policy, but he allegedly has brought Rapture theology into the CIA. 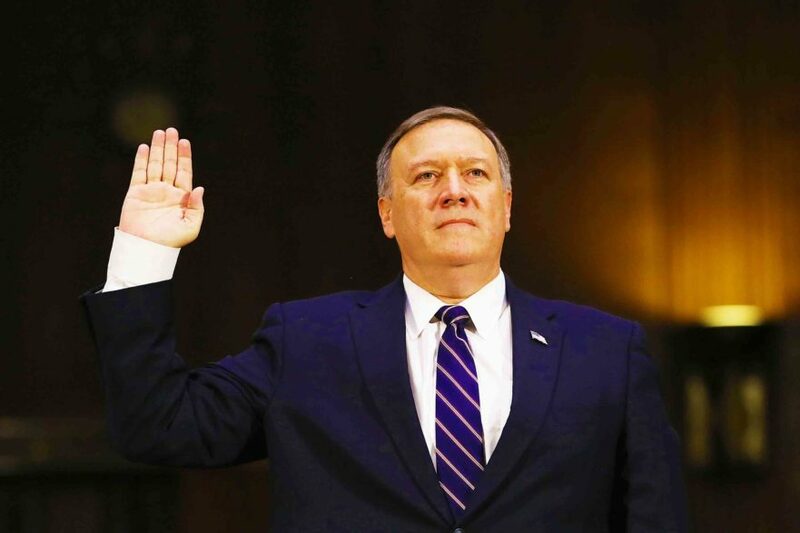 Michael Weinstein, founder of the Military Religious Freedom Foundation—a watchdog group on issues of religious freedom in the military and intelligence community—told TYT that Pompeo has talked about the Rapture at the CIA during his tenure as director there. Congressional disclosure forms show that Pompeo has claimed a “special interest” in Israel. In August of 2011, when Pompeo was still a member of the House, he and his wife took a weeklong, first-class trip to Israel entirely paid for and planned by the American Israel Education Foundation at a cost of $27,532.38, according to travel disclosure records reviewed by TYT. The foundation is an affiliate of the American Israel Public Affairs Committee (AIPAC), the main U.S.-based Israel lobby group. Pompeo’s reason for the trip, according to his travel disclosure form, was that he “has a special interest in Israel.” The form does not identify the nature of Pompeo’s interest. According to the itinerary provided by Pompeo, he engaged with many officials in the Likud, Israel’s right-wing party led by Benjamin Netanyahu. One official was Ron Dermer—then an advisor to Netanyahu—a figure of some controversy in the U.S. In 2016, for instance, Dermer came under criticism for accepting an award from an organization designated by the Southern Poverty Law Center (SPLC) as an anti-Muslim hate group. The organization, the Center for Security Policy, is described by SPLC as “a conspiracy-oriented mouthpiece for the growing anti-Muslim movement in the United States.” The group was founded and is run by Frank Gaffney, a prominent figure on the far right known for Islamophobic comments. Dermer accepted the award anyway. His spokesman said he was “honored” to do so and that Dermer “is not aware of any anti-Muslim views” held by the organization. He is now the Israeli ambassador to the U.S.
Also during his stay, Pompeo attended seminars with titles including, “Terror from Gaza and Sinai,” “Hamas Next Door,” “Hizballah Next Door,” “Bashar Assad Next Door,” “Defensible Borders,” a “Strategic Tour of Jerusalem,” and “Israel’s Strategic Concerns and The Arab Spring.” The only listed visit with Palestinians was a one-hour meeting with the Palestinian Authority’s Prime Minister. Pompeo met with numerous military and law enforcement officials, Israel’s Ambassador to the U.S., the President of Israel, and Israel’s Prime Minister. Ken Klippenstein is a freelance journalist who can be reached on Twitter @kenklippenstein or via email: [email protected].